Here is the Holiday Schedule from today through the end of the year. We do not have class on Wednesday, December 24, Thursday December 25, Saturday December 27, Wednesday December 31 and Thursday January 1. 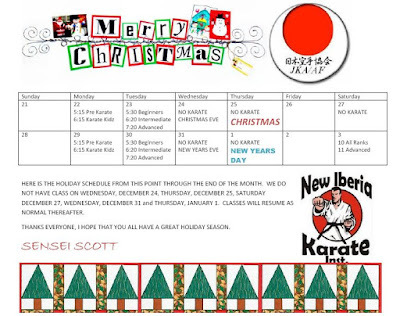 We do have class on Monday December 22, Tuesday December 23, Monday December 29, Tuesday December 30 and Saturday January 3rd. Thanks to everyone for making the Christmas party special. To see a larger image of the announcement above, click on the image. 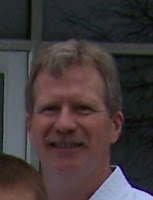 Our Student of the Year for 2008 is Steve Bellingham. 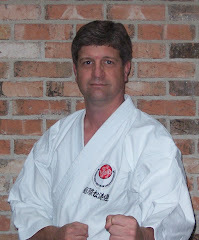 He is a Shodan who trains with his two sons at NIKI. He is very active in participating in events beyond the walls of the dojo. It is through challenging himself and keeping motivated that he and his family are so successful in Karate. Congratulations Steve on a job well done and a title well earned. Keep training hard everyone!